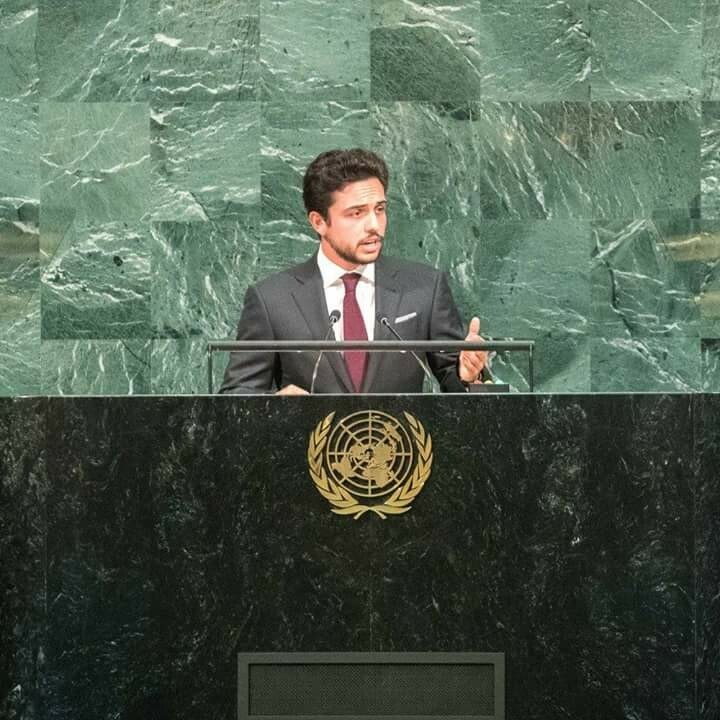 HH the Crown Prince, Prince Al Hussein Bin Abdullah II, delivered a speech on Thursday at the 72nd session of the United Nations General Assembly, on behalf of His Majesty King Abdullah II. I have the honor today to speak to you, the representatives of His Majesty King Abdullah II and the Jordanian people. Mr. Lachack, allow me to convey to you Jordan’s congratulations on your election and to express to you our keenness to work with the General Assembly. Mr. Secretary-General Guterich, I convey to you the deep appreciation of Jordan for the partnership you have established with our people. Two years ago, I had the opportunity to express the aspirations of the sons and daughters of my generation when I presided over a meeting of the UN Security Council to adopt the first UN resolution on youth. Our joint efforts culminated in the unanimous adoption by the Security Council of historic resolution 2250 on “Youth, peace and security“, which aims to enable young people to participate in peace-building and conflict resolution. Today, I stand before you as the representative of my beloved country Jordan, and also as a young man belonging to the largest generation of young people in history. We are as young as the generations before us, bearing the legacy of wisdom and common values ​​left by our forefathers. Like our predecessors, we must strive to reconcile what we have inherited with the reality we are living today, an unprecedented reality. Our world today is at a crossroads, as a result of the convergence of deep-rooted globalization with technological innovations that are making a profound difference. The world is also on the threshold of a fourth industrial revolution that redefines how our societies operate and how we interact with one another as human beings. In a world that is highly interconnected by technology, people are coming closer to each other, and the division between them is increasing. In the midst of all this, the young men and women of my generation wonder: What values ​​are global citizenship today? And in what direction does our ethical connection indicate? Will it guide us to justice, prosperity and peace for everyone? The sons and daughters of my generation are often described as dreamers, but we all know that every great work begins as a dream. The importance of our efforts is often underestimated and described as idealism, but striving for idealism is not naive; it is courageous and courageous; it sharpens our hopes for our own ideals, so that we do not compromise or retreat from our principles in adversity. Let me here, on behalf of my generation, try to catch some clarity in the blur of the scene and ask a number of fundamental questions away from the politic politeness I know I will acquire over time. I will take from my country Jordan a model for discussing these ideas and questions. I believe that the situation of Jordan embodies everything that is happening in our world today, both right and wrong. Jordan has historically faced external shocks one by one, but the last two decades have been extremely difficult. Many conflicts now surround us from many sides. Over the past years, we have witnessed wars in Gaza, Iraq, Syria, Libya and Yemen, as well as the stalemate in achieving Peace in the Palestinian-Israeli conflict. Jordan was also forced to bear the consequences of the global financial crisis and energy crises. All these events have left a deep and tangible impact. I have blocked the way to Iraq, which is our biggest export market, and trade with Syria has been cut off, leaving our main commercial ports to Turkey and Europe. The tourism and investment sectors were also affected by the instability in the region despite the efforts we made to prevent it. I do not know if there has been another country in modern history that has been subjected to such a great number of successive crises and found itself surrounded by a large number of conflicts to which it had no hand. Jordan’s resource-poor country, amidst a crisis-ridden region, hosts 1.3 million Syrian refugees, millions of Palestinian refugees and hundreds of thousands of Iraqis, and others from Libya and Yemen. Jordan today is one of the world’s most hosting countries for refugees. The direct cost of the Syrian crisis drains more than a quarter of our budget, and its impact extends to our communities, where 90 percent of Syrian refugees live. Consequently, there are increasing pressures on the housing, food, energy, health care, education and employment sectors. Despite these great challenges, we have not retreated from our principles and values, and we have never turned our back on those in need. Despite our enormous debt, we stand proudly and confidently with what we have done; our soldiers are facing bullets and they are helping refugees to safely cross into our land, not to repel them. We have not hesitated in our reform efforts, despite the difficult impact some of them have on our people. Conversely, the heavier the pregnancy, the more determined we are to make progress. We do not claim the idealism, and we are fully aware that in order to reduce unemployment and provide jobs for young people and future generations, we must radically improve the investment environment, promote integrity and accountability, develop the education system and support young entrepreneurs. In normal circumstances, it is normal to link aid to our progress, but we are in exceptional circumstances where aid is an important platform so that we can continue our political and economic reforms. The difficult circumstances have not prevented Jordan from continuing to contribute positively to the good of the world. We are committed to a just and peaceful solution to the Palestinian-Israeli conflict based on the two-state solution, despite the lack of optimism. We also continue resolutely to uphold the duty of the Hashemite guardianship over Islamic and Christian holy sites in Jerusalem. Preservation of the historical and legal situation in Al-Aqsa Mosque / Haram al-Sharif is the basis for achieving peace in our region and in the world, based on the city’s status in the divine religions. Our resolve has not been condoned in the international war against terrorism and in our concern to spread the true values ​​of true Islam. Jordanian peacekeepers have contributed to the protection of innocent civilians in Haiti, Darfur and East Timor. The voice of Jordan also stands out in the call for moderation and openness to all social components and their integration in an area where the ruckus of extremism and extremism prevail. Jordan has always done the right thing, time after time, because this is the essence of integrity, honesty and trust, but how was the world reacting to this? Jordan is always appreciated and praised for its humanitarian and moral positions. We are proud of our country’s reputation, but good speech does not support the budget, does not build schools, and does not provide jobs. Therefore, important questions remain for Jordanians, especially young people. How can a small country such as Jordan, struggling in the face of such overwhelming difficulties, continue to suffer under the pretext that its friends suffer from the financial strain of providing support? Financial institutions often remind us that we are one of the most recipients of aid at the individual level, but by the same token, a country that has a large number of external shocks or contributes to global peace and security, such as Jordan, is rarely found. How can a country such as Jordan provide shelter to millions of desperate and needy people, while the debate is going on in much richer countries about accepting a few thousand of them? What does it mean to our common humanity that the world spent nearly $ 1.7 trillion on weapons last year alone, but failed to provide less than $ 1.7 billion in response to the United Nations Relief Appeal to support Syrian refugees and their host communities in countries like Jordan? What does it mean to spend trillions on wars in our region, while little is spent to reach them to safety? These questions have no satisfactory answers. The painful reality is that the economies of war are flourishing for the benefit of the few, while real economies continue to suffer, causing harm to all. Thus, the message to the youth of Jordan and our region is clear: there is no shortage of funds to fight evil, but the desire to reward Virtue is almost absent. Thus, the voices of those who defend and build are drowned in the noise of those who attack and destroy. This logic is not equal. So what do we say to the people of Jordan? What does the international community say to our young people? Do we tell them that the values ​​that govern our way of life are worthless? Do we tell them that pragmatism overwhelms the principles? Or is indifference stronger than empathy? Or do we tell them that we must avoid risk, and turn our backs on the needy, because no one will support our backs? It is time to break the silence and begin to look for answers to these questions, so that we can launch an international effort that will bring our common humanity to safety. Our commitment to the values ​​of peace, moderation and international cooperation is unshakeable. The world must choose between two ways: Either the fruit tree is thirsty, or the oil pours on the raging fire. A false interpretation will always lead to a false sign…the Sign of a cult.